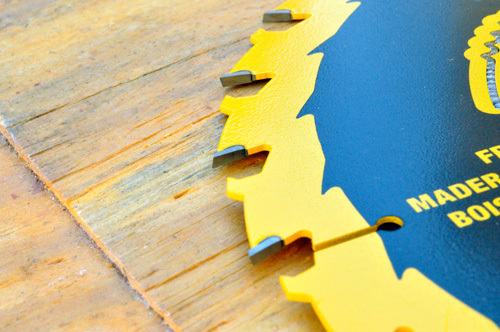 In June of 2011 DeWalt expanded their line of Precision saw blades with the new Precision Framing Blades. 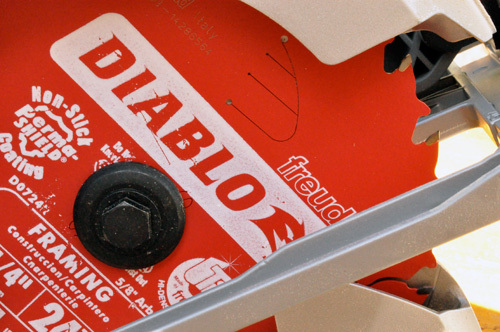 These blades provide superior blade control, longer life and durability for jobs like framing, roofing, and siding installation. If you talked to any blade manufacturer, they’d probably tell you something similar. DeWalt says their blades are different because of new tooth geometry, resin-filled expansion slots, and an anti kickback shoulder, and to prove it they sent me one of their blades along with a comparable Marathon and Freud framing blade. Editors note: Bosch got wind of our little saw blade comparison and immediately offered to send a Daredevil blade. Look for an update to this post with all four blades. The new tooth geometry features a front face grind that creates a sharper tip to help reduce the blade’s cutting force. You can see the expansion slots that make room for blade plate expansion caused by heat from friction. These slots are filled with resin that will dampen vibrations and improve cutting performance. The new anti kickback shoulder helps keep the blade from over-feeding and reinforces the carbide tip for impact resistance. I’ve learned to keep engineered lumber handy because it’s great for testing products. I grabbed some spare LVL and took turns with each blade, pushing them through as fast as possible to get a sense of durability and kickback. I also setup a piece of 3/4″ plywood to compare plunge cuts. 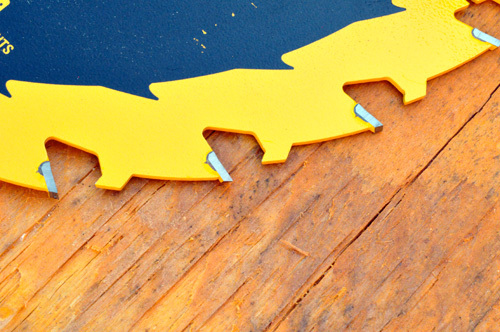 Cutting ability and durability are the two most important qualities for a saw blade. If your product cuts well and last longer than the rest, even brand loyal pros will make the switch. Right away I was disappointed with the Marathon blade. It struggled to cut through the LVL as fast as the Freud and DeWalt blades, and it had the worst kickback. 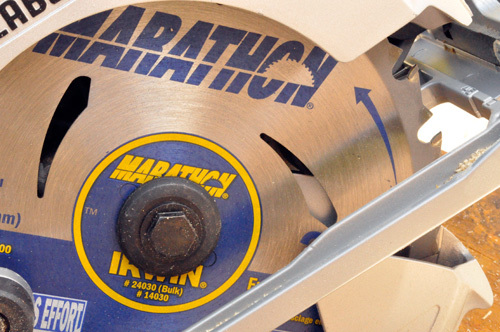 This wasn’t the new Marathon WeldTec circ saw blade that I previewed in March, and I’m sure that the WeldTec would have performed better. 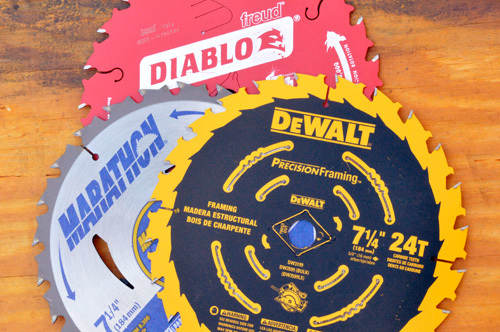 The DeWalt and Freud blades performed similarly well, and neither was a clear standout. I did notice that most of the resin found in the expansion slots on the DeWalt blade was gone after about 15 cuts. If you look closely in the pictures, you’ll see it missing on the outer slots. I wasn’t cutting deep enough for the inner slots to contact anything. Even though I can’t comment on longevity, anything that only last 15 cuts isn’t really a feature to me. Overall I liked the DeWalt blade. I want to spend more time using it, but already I consider it a quality choice. 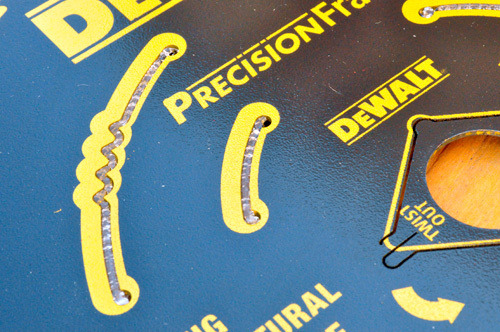 The new Precision Framing Blades are offered in 6-1/2″, 7-1/4″, and 8-1/4″ diameters with a variety of tooth counts. Looks like the carbide on the Freud is the thickest. You would get a lot more sharpenings out of a thicker carbide. Do you know the cost of each blade? Good question. I found the Marathon and Diablo blades online for about $12. I’m checking into the DeWalt…..
Just learned the DeWalt blade costs $10. Seems like a great choice for the price. Up at the top I mentioned you’d use these for framing, roofing, siding. Framing blades are also good for building concrete forms. 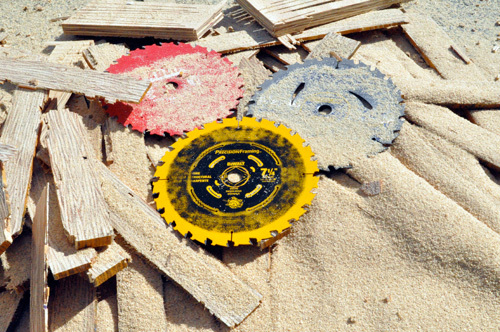 Basically it’s a general construction blade designed for fast ripping and cross cutting. As a general rule the lower the tooth count the rougher yet faster the cut. 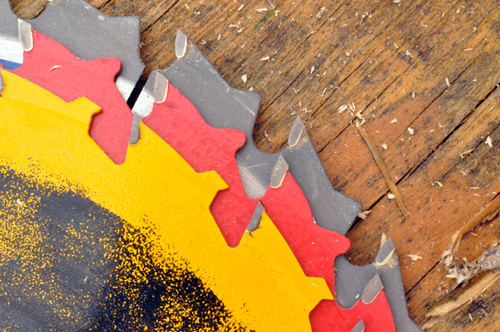 So a 24 tooth circular saw blade is a framing blade, but you can get 60 tooth finishing blades. Then there’s tooth profile, kerf, etc… etc… there are a LOT of options for saw blades out there. But basically a good framing blade and a good finish blade should meet most of your needs. You can also get a decent general purpose blade that will do a lot but won’t cut as fast as a framing blade and will leave rougher cuts than a finish blade. ah missed it. I guess that’s because you would make a lot of cuts that would give your blade a tough workout? I’m not sure that anyone would fool around with getting a $10 dollar blade resharpened; so I can’t see the concern with carbide size. Do you have any idea how long the respective blades last? It sounds like you made only a few cuts.